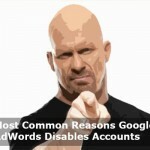 If you have had Google AdWord account banned, you have to read this article. Making a mistake on Google AdWord is something you would want to avoid by all means because there are no second chances on Adwords. I made my mistake there, so I would share my experience to avoid you from falling into the same booby trap. Some weeks ago, I made some advertisement on my blog through Adwords. I then got a red marker indicating I had violated some trademarks. I then made an appeal, but my account was blocked the very next day. “Thank you for your patience. I’ve consulted your account with our specialist team, and it has come to our attention that your Google AdWords account does not comply with our terms of service and advertising policies. You have repeatedly submitted ads that violated our copyright policies in a related account. As a result, your account has been suspended, and your ads will no longer run on Google. Since I was convinced that I had not done anything wrong, I passed this for a temporary suspension. There was technically no suspicious thing I did, I took responsibility for my action and demanded nothing in return. My blog was raking in over $20,000 monthly from adverts, and even Google themselves had contacted me stating that they would be offering me phone support due to the volume of ad revenue I was generating. When I noticed nothing was done to remove the block on my account, I contacted Google once again through chat and phone calls. (You can reach them on 1-866-2google), it was then I got the rude shocker. It was a permanent suspension. When I pressed further, I was told that there was nothing that can be done to my account and nobody else was in the position for me to talk to and that was the final decisions of their “Specialist” team. My means of livelihood was taken away just because of a little error anybody could make. I was banned forever from making ads on Google again. Why it hurts so bad is that I wasn’t warned neither was I allowed to make up for my mistake. Even Federal offenders with a weighty crime do get second chances or even a bail. Though I understand that Google is very strict on trademark issues, but why treat us like murderers? Thank you for your email. I understand your concern regarding the suspension of your account. However, as mentioned in our previous email, your Google AdWords account has been suspended due to multiple Copyright disapprovals. We are unable to revoke your account suspension, and we will not accept advertisements from you in the future. The reply was somewhat hypnotic. I decided to fight on still in the face of the setback. This time, I tried reaching out to Google inside people via LinkedIn, but as expected they declined my invitation. I then knew it was no use trying further. I see Google Adwords team as a heartless set of fellows who don’t care if you get drowned due to a little mistake. They act like they would not make a mistake at some point in time. Now that my account is gone, I figured it was time to move on. After three weeks of searching for another alternative, I discovered Yahoo and MSN hold some promises. Doing ads there has improved quite a lot. So I am going to hit the roads once again with everything new. The website, home address, credit card number, computer and IP address are all going to be new. I believe this is a learning curve for everybody. It’s an error to depend only on Google Ad for your income. You might just wake one day and discover that the business you have toiled to build has gone up in smoke. It is the bitter experience I had. I hope you won’t have to go through the same experience. Show some love to other bloggers and let them know that there is no room for mistakes at all on Google Adwords. to ensure we do not get banned again? because you were in contact with customer support. It goes without saying, a major key to your success online will depend on some form of advertising. Google Adwords is by far the best approach you can take when pondering this avenue. A number of changes has been implemented more recently in light of Google’s continued crusade against scammers, illegal activity, spyware, and malware, which has become more strict. Now with these changes, more advertisers are finding they can use this great marketing tool efficiently and effectively, while feeling safe and secure doing so. When it comes to the rules and regulations of Google Adwords, they hold a determined policy which you will have to follow if you don’t want your account permanently banned. People make mistakes as they are only human but it will end with the same result so to succeed, here are a number of different reasons your account could get blocked. Making a living online can be hard, so read on for more information to make it just that little bit easier.